World number one Rory McIlroy has been pitted against American veteran Phil Mickelson in the opening fourballs of the 40th Ryder Cup on Friday. 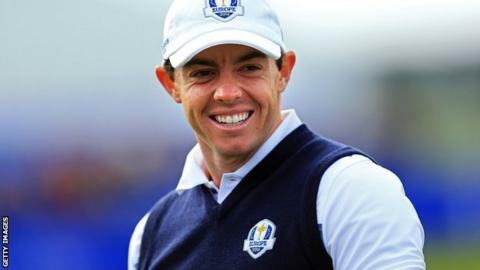 McIlroy and Spain's Sergio Garcia are up against Mickelson and Keegan Bradley in the morning's fourth match. Justin Rose and Henrik Stenson will begin Europe's defence against Bubba Watson and Webb Simpson at 07:35 BST. English Ryder Cup talisman Ian Poulter has been paired with Scottish rookie Stephen Gallacher. Gallacher, the only Scot in the European team, and Poulter, who has won 12 of 15 Ryder Cup matches, are up against two debutants in Jordan Spieth and Patrick Reed in match three. United States captain Tom Watson has thrown all three of his rookies into the first session, with Jimmy Walker partnering Rickie Fowler against Martin Kaymer and Thomas Bjorn in match two. "I think fourballs is a good place for the rookies to get their feet wet, playing every shot," said Watson, 65. "I have every confidence in the world in them doing very well. Jim Furyk and Matt Kuchar will probably be played in the afternoon foursomes." Explaining his decision to pair Poulter with Gallacher, Europe captain Paul McGinley, 47, said: "Ian will enjoy the atmosphere Stevie will create with a Scottish following. Ian is looking forward to that role." "I'm absolutely buzzing," said 38-year-old Poulter. "Playing with Stevie in Scotland in his first Ryder Cup, it's going to be amazing. "I can't wait to walk on the tee to loud, rapturous applause and smash it down the middle." McIlroy and Mickelson, playing in his 10th Ryder Cup, were involved in a minor spat on Wednesday, which will give their contest a bit of extra spice. Mickelson made a joke about McIlroy's court case against former management company Horizon, which still has Ryder Cup team-mate Graeme McDowell on its books. "It's going to be a difficult match against what we perceive as the strongest team that Europe has," said the 44-year-old Mickelson. "We have our work cut out for us, but we're on top of our games as well and hopefully we'll have a good match." "The last match in the session sets the tone and it's quite clear that both captains have taken that on board. Paul McGinley putting McIlroy and Garcia out together, he knows that those two wanted to play together. I think Garcia is going to be a hugely significant figure in this European effort this time - he's under the radar but playing wonderful golf. And of course Keegan Bradley and Phil Mickelson were such a successful pairing at Medinah and that is the last match out. It will be pivotal in swaying which way that opening session goes." McIlroy and Garcia are a new pairing while Mickelson and Bradley won all three of their matches together at Medinah in 2012. "They are obviously a very strong pairing," said McIlroy, 25. "They've never been beaten together and we're looking to hand them their first defeat tomorrow morning, so it will be a tough match, they're both great competitors. "I couldn't ask for a better partner. Sergio is one of my closest friends on Tour and we always got along well. I think that it was only a matter of time before we got together in Ryder Cup." McGinley expects to make changes for the afternoon foursomes as he looks to use all 12 players in his team on the opening day. "My plan is to get all 12 out," he said. "But I wouldn't say it's written in stone, because you can never say never." He added: "The Ryder Cup's not going to be determined tomorrow, and there will be decisions I'll get wrong as captain. That's what happens. I'm prepared for that. But I'd like to think that I'll be able to adjust things and go forward." Friday, 26 September: BBC Radio 5 live, 08:30-19:00. The Ryder Cup Highlights: 20:30-22:00, BBC Two; 20:30-22:00 BBC Two Scotland; 23:05-00:35 BBC Two Wales; & 20:30-22:00, BBC Two NI. Saturday, 27 September: BBC Radio 5 live, 08:30-18:30. The Ryder Cup Highlights: 20:30-22:30, BBC Two. Sunday, 28 September: BBC Radio 5 live, 11:00-18:30. The Ryder Cup Highlights: 19:30-21:30, BBC Two. Live text & radio commentary, and video highlights, of all three days available on the BBC Sport website. The greatest sporting show on earth? Read more on Ryder Cup 2014: The greatest sporting show on earth?